Lewis Sifford was honored with the Mark Robinson Lifetime Achievement Award for his outstanding contribution to the American Board of Trial Advocates. This is only the second time this award has been presented in the organization's 60 year history. Read the Article Here. 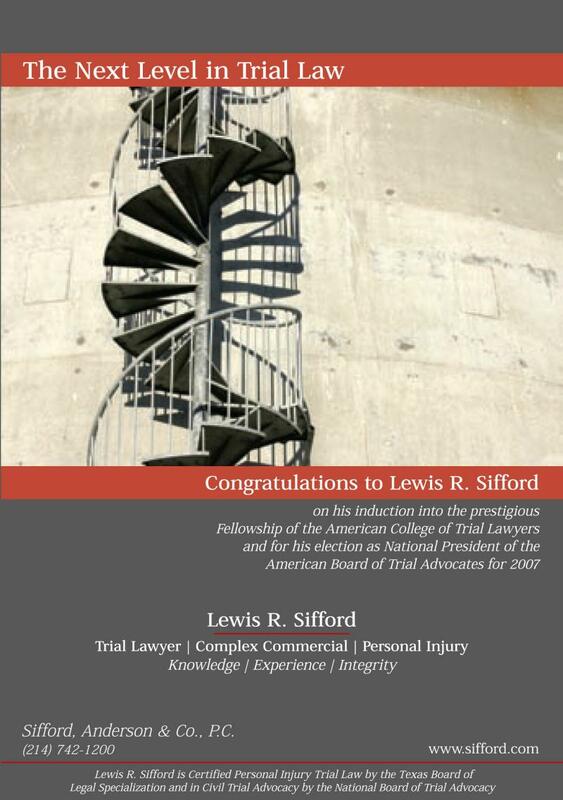 Lewis Sifford is featured in the American Board of Trial Advocates Educational Video. Lewis was the 2007 President of ABOTA and frequently educates lawyers by participating in educational trial demonstrations. ABOTA is a national association of experienced trial lawyers and judges dedicated to the preservation and promotion of the civil jury trial right provided by the Seventh Amendment to the U.S. Constitution. First and foremost, ABOTA works to uphold the jury system by educating the American public about the history and value of the right to trial by jury. 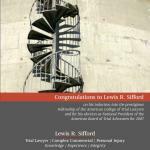 Lewis Sifford is chosen as a Fellow to the American College of Trial Lawyers. The American College of Trial Lawyers is the only professional organization in the world to count among its members every member of the Supreme Court of the United States and every member of the Supreme Court of Canada. The College is devoted to improving the standards of trial practice, the system of justice and the ethics of the trial bar. Jennifer Stephens is selected by Texas Monthly magazine as a Texas Super Lawyer - Rising Star for 2011. Jennifer Stephens is awarded the Star of Excellence for her outstanding contribution to client Lone Star Distribution. Lewis Sifford is selected as a Fellow of Litigation Counsel of America. Litigation Counsel of America is a trial honor society composed of less than 1/2 of 1% of American Lawyers. The purpose of LCA is to recognize deserving, experienced and highly qualified lawyers, to provide an outlet for scholarly authorship of legal articles on trial litigation practice, to provide additional sources for professional development, to promote superior advocacy and ethical standards in the practice of law, to assist in community involvement by its membership, and to advance a superior judiciary by taking relevant positions on issues or legislation affecting judicial compensation and/or benefits, as well as those affecting the American litigation processes. Lewis Sifford was honored with the ABOTA Lifetime Achievement Award for his outstanding contribution to the American Board of Trial Advocates. This is only the ninth time this award has been presented in the organization's 60 year history. Read the Article Here.